At Appliance Analysts, we know just how important good water is. What’s the point in buying a fantastic ice maker if the ice is just going to spoil your drink, right? That’s why we’ve put together this lightning quick guide to some of the best inline water filters we’ve found, specifically for keeping your ice as crisp and refreshing as it is cold. One quick note: make sure to double check the pipe sizes before you buy. Most of the time, your appliance will fit 1/4″ connectors, but there are the odd 3/8″ sized models out there on the market. Both options are available on Amazon for each of our top products below. Each of the products below match these categories to our satisfaction. Where the price varies, it’s mostly due to these factors increasing in one way or another. Particularly, price tends to vary with how long lasting a filter will be. There’s a big difference between filters you want to switch out and replace every 6 months, versus a beastly ‘set and forget’ filter that you can leave working away for years. We’ll be honest – this one isn’t cheap. But there’s a reason it’s got a #1 beside it’s name. With this filter, Woder have made a true ‘set it and forget it’ product. This inline filter boasts an expected lifespan of 3 years, or around 10,000 gallons of water. Which is more than triple any of the other popular filters. With that in mind, we think the price jump is more than understandable considering the huge amount of extra capacity you get from the product. The extra amount of water processed isn’t the biggest factor, either. It’s the peace of mind. The lack of extra thought and effort that goes into keeping track of filters and having to get in and replace them every six months or so. The Woder is also fantastically efficient. This isn’t a few months of great filtering, then a slow decline for 3 years. This is a solid and consistent filter, which will continue providing that crisply fresh water for years to come. With a complete money-back guarantee from Woder, if you don’t find things to be working out. And if you need another reason to love them, the filter is entirely USA-made, with NSF (National Sanitation Foundation) certified materials. 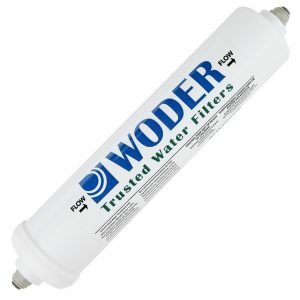 So while it does require a bit more of an upfront investment, this inline water filter by Woder is the undisputed holder of our #1 ranking. Amazon’s #1; available with 3 filter cartridge types. 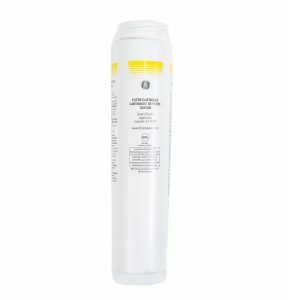 When it comes to knowing what level of filtration is right for you, we recommend the following: if by all accounts you’re happy with the way your water tastes, and just want to ensure that you’re getting the freshest possible water, then the basic cartridge will cover everything you need. 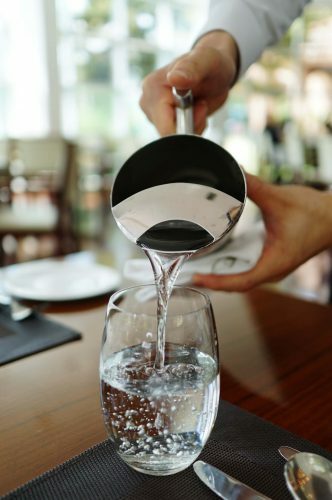 However, if you’re water does seem to have a naturally unclear look and/or a strange taste/smell, we recommend getting in touch with the EPA here to get expert advice on how to test your water for contaminants. That said, the USA has one of the safest public water supplies in the world. 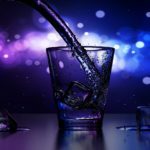 Chances are that a basic level of filtration will give you that extra boost of water quality you need, and it’s probably worth giving that a shot first if you’re not sure what you need. For the product itself, it’s an easy-to-install cartridge that hangs down from the water line. That does mean you need a bit of space – typically in the form of a wall to fix it to. It’s approximate 3,000 gallon lifespan means you should be switching out the cartridge regularly, around every 6 months or so. That said, even the basic one works great to keep things tasteless and odorless. A great pick-up if you’ve got that bit of space behind your appliance to allow for installation and regular cartridge swaps. Check out Amazon’s #1 inline water filter here. Another hanging cartridge filter, this GE model is similar to the the Culligan in terms of easy installation and cartridge swapping. The difference lies in the cartridge itself. While Culligan offer 3 levels of filtration in their cartridges, GE just provide the one type. That said, it’s a damn good one. While GE state that it’s lifespan is only 750 gallon – we believe that they’re giving us a more honest, up front approach. Where this much lower number is the point where optimal quality starts to drop, rather than until it’s dying breaths at a few thousand gallons. As with the Culligan, expect it to last around 6 months before needing a replacement. This model is actually so good that it’s inspired it’s own knock off brands. We’ve provided a link below, if you want to check that out – where they’ve actually titled their own product as “GE comparable”. However, these cheaper knock offs appear to weigh much less, and so likely have much less charcoal and will run out in half the time. That being said, people do seem to like them – which is why we’ve included a link below. Check out the original GE filter here. Compared to the cheaper, but still quite good, knock-off brand here. Our top three filter recommendations to go alongside your perfect ice maker (or refrigerator). While we’re no filtration experts, we’ve found these three filters to be at the top of the game in terms of reliability, ease of installation, and in providing a great level of filtration. If you’re still not completely set on one of these, there are a bunch of other options available on Amazon (see some examples here). However, we can’t guarantee that they will be as efficient or as reliable as our three recommendations here, which we’ve thoroughly researched and personally recommend. 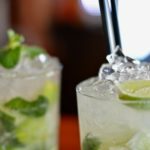 Have you stumbled across this post, but are still looking for your perfect ice maker? 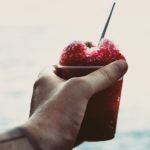 Want to complete your ice making package? If you want to look after your appliance long term, we recommend picking up an ice maker cleaning product – which are specially made to help prevent mould and frost. If that sounds like a good idea, we recommend checking out this ice machine cleaner / descaler because of it’s great price for great quality. When it comes to appliances, a little preparation and maintenance can go a long, long way in getting the most out of your purchases.